Almost ready to put this thing on the road. I was having lots of problems with the engine last I was on here. Turned out the engine was the proble. Not most of the components. I installed a 4.0 and just getting it tuned. Installed all new tires, springs and shocks and new body mounts. Don't know if those have anything to do with my issue, but at full turn in both directions it has an awful grind rub sound. Inside the vehicle, I thought to myself that I need to cut the plastic to fit the tires. When I got out and checked, nothing seemed to be rubbing. I read on some post that there is a stop that needs to be greased, but that was for a disco. Is there something on these classics? Not sure how. It’s really noticeable if you run mud terrains! Haha. I solved that problem on my truck with 30mm aluminum wheel spacers from Atlantic British. You can also keep your turning radius this way and a slightly wider stance. There's a stop bolt on front axle on mine, a 1991 yr that can be adjusted to stop the tires from touching radius arms etc. But there's a possibility that the centre diff, if it has a viscous coupling, has locked. Or diff lock on other types. When you run it on full lock with centre diff locked, it'll make all sort of noises and probably snap a driveline component if severe conflict. The check for this is to jack only one front wheel just clear of the floor, then try by hand to rotate that wheel. It should go with resistance of about one rotation in 30 seconds. If you can't rotate it, then the viscous coupling is most likely faulty. You need to verify this before chasing anything else as it's a serious impediment to these transmissions. As mentioned above probably tires rubbing on radius arms. You should see a mark on the arms where they are rubbing to confirm. 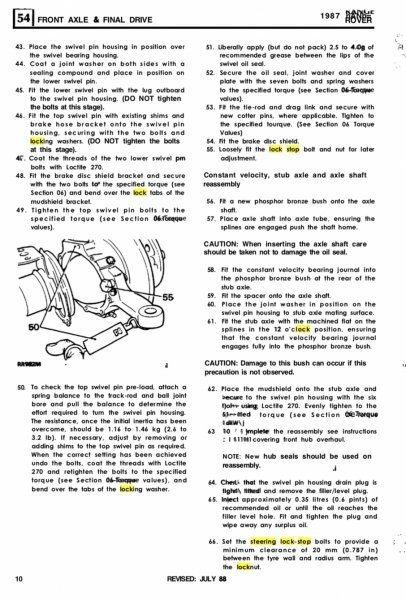 Adjustment is simple... just look it up in Shop Manual. wow you guys are fast today. Thank you. I will check those tomorrow. Recently purchased a 1995 Alpine LWB that had both the Radius Arm foul and the seized viscous coupling. Installing used Borg Warner transfer box and looking into the spacers mentioned above. Thanks for the info! I think I need some spacers. I do like to support Atlantic British, however $350 for a set is quite a bit more than I would like to spend. Anybody have a better option? Other than not turn my wheel to full crank. I would like to widen my stance a little. I think the classics look a bit narrow. I could add some very small spacers, but I do not want to compromise the lug nut and studs. you could try a google search, or uk vendors such as rimmer bros, p38spares, jgs4x4parts, jc's land rover parts, island 4x4. etc. 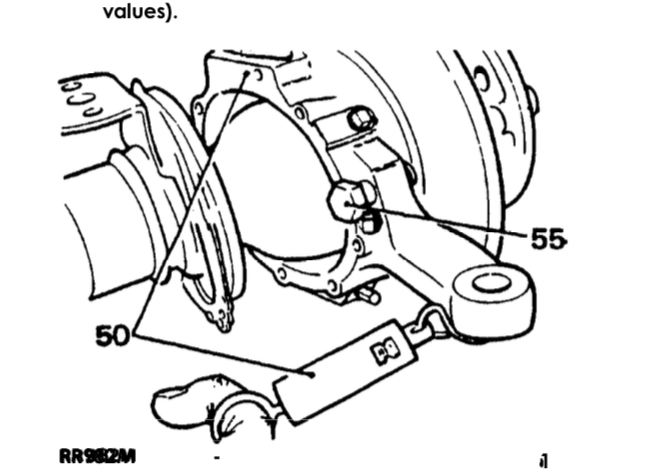 Adjust the steering stops (#55 in pic).... obviously it will not help your desire to widen the stance. You did not say if you are running stock or aftermarket wheels? What size tires? Thank you for all your help. I purchased some wheel spacers. Not only does the rover look a tad bit more aggressive (think they need that unless going for the stock or luxury look), but I got rid of the noise. I didn't see where it was rubbing, but its not now. Rubbing sound when turning. Normal or a problem? Grinding Sound When Turn Wheel to Far Right-Any thoughts?